Rediscovering a sense of camaraderie among fellow warriors is as important to the Soldier Ride® experience as the actual ride. SAN DIEGO (August 3, 2017) – When Marine Corps veteran Nicole Robinson arrived in San Diego, she had two goals – to support the other warriors around her and stay positive. She attended Wounded Warrior Project® (WWP) Soldier Ride® with 40 wounded veterans to connect with them while challenging herself during the multi-day bicycling event. Like all of WWP’s physical health and wellness programs, Soldier Ride is adaptable to the stage of recovery of each wounded veteran. At the start of every Soldier Ride, warriors are fitted with adaptive cycling equipment to accommodate injuries and make the ride as comfortable as possible. For Nicole, this was especially important with her severe injury that greatly limits her mobility. WWP empowers the warriors it serves to thrive in the civilian world. Rediscovering a sense of camaraderie among fellow warriors is as important to the Soldier Ride experience as the actual ride. During previous events, Jeshua had been more reserved about his service and kept to himself. 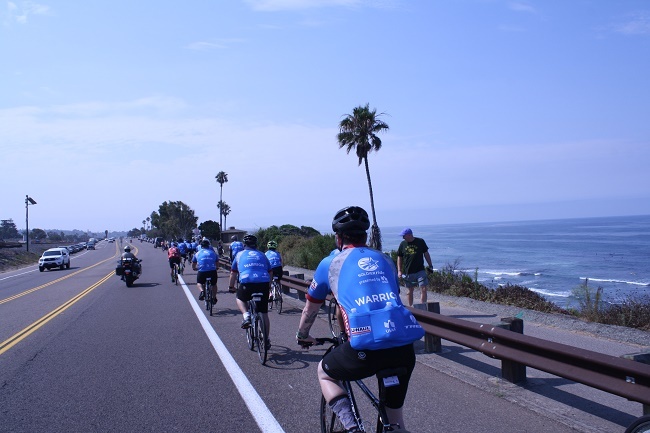 However, he found himself opening up during the San Diego ride. In a WWP survey of the injured warriors it serves, more than half of survey respondents (51.7 percent) talked with fellow veterans to address their mental health issues. The same survey found 29.6 percent of survey respondents expressed physical activity helps them cope with stress and emotional concerns. To learn more about how WWP’s programs and services connect, serve, and empower wounded warriors, visit http://newsroom.woundedwarriorproject.org. To find photos from this Soldier Ride, click on multimedia, then images.